You are here: Home / Blog / Encouragement / Can You Thrive And Not Just Survive February Homeschooling? Yes! Why do you sneak up on me and then drag out your days until eternity despite being the shortest month of the year? Why do you keep cramping my homeschooling style? Sorry, February, not this year. Nope. I’m taking February homeschooling by (snow?) storm and I’m going to encourage my friends to do the same. Can we be friends, February? Can we partner together to thrive and not just survive homeschooling in the longest shortest month of the year? Disclaimer: If you’re a new homeschooling parent, you might not get what the hubbub is about February homeschooling. That’s okay. I am hoping that these ideas and a bit of humor will prevent your homeschool from going sideways from February 7 until March 18 when you wake up one morning and it’s nearly spring. Ask me how I know. So, what is it about February? To understand this mystery, let’s first examine January. January homeschool is all about relishing the post-holiday fun, cleaning up from the holidays, planning, and of course trying out all those awesome educational “toys” your kids received as holiday gifts. You’re rocking January and feeling awesome because you’re still nibbling off the secret stash of Christmas chocolate, those candy canes aren’t going to eat themselves so hot cocoa is still flowing, you take a week to reorganize your homeschool supplies because you finally got one of those amazing rolling metal carts, and all is right with the world. Are you still with me? In January, you’re doing all the things, you’re fresh and rested (you did a take a holiday break, right?) and everyone is craving a bit more routine. And then we get to February 1. The holiday shine has worn off. Those science kits have all been completed. The art supplies are in the bathroom and your daughter has made all the slime in the world because she received three gallons of glue for Christmas. True story. You decide to push through February because the groundhog saw his shadow and winter isn’t going anywhere anytime soon. Perhaps it’s been cold and snowy where you live since December and you’re itching for a warm day. Maybe you started a new curriculum in January because you needed to shake things up and now six weeks later, everyone is fussing and the fun has been sucked out of your days. We don’t need to hit the wall in February, friends. With a bit of planning, a mindset shift, and Valentine’s day chocolate, we can embrace February homeschooling. Now, before you read on, let me clarify: I am not suggesting you completely throw out your ENTIRE homeschooling routine for the duration of February—unless you want to. You’re the boss of your homeschool. Take a vacation: If you have the means, can plan ahead and have the desire to travel off season– a February vacation might be a great idea. Let your kids help with the planning! Have them research the location, price out activities, check out the food scene, budget for gas or plane tickets. Lifeschooling, people. It’s a thing. And if you go somewhere warm and sunny, you can soak up that much needed Vitamin D. Everyone wins! Plan a break week: I do this! We homeschool five weeks on and one week off throughout our homeschool year. Having built-in breaks is absolutely crucial for us. You will need to check your state’s requirements, but if you can plan to take a week off and just be home, go to appointments, clean out the house, do a staycation, or just sleep and eat Valentine’s chocolate–I promise you will feel revived and your kids will be thrilled to take another winter break. Take field trips: Do field trip Fridays—or Mondays—or whatever day works for you. Plan out a month’s worth of field trips and have your kids do some research before hand to extend the learning. Try to find places that are off the beaten path. Invite friends to come, back a cooler with food (because you know someone will be hungry), get out and explore your area. Do theme days/weeks: February has several holidays that make for great unit studies. Gather some books, documentaries, recipes, easy-to-do projects, and create theme days or weeks. It doesn’t have to be complicated. Shake up your routine a bit. Some themes include: President’s Day, Black History Month, Valentine’s Day, Chinese New Year (check the dates/years). Make movie madness: Are you four years behind on movies? Is your Hulu queue getting long? Grab the snacks, blankets, and footie pajamas and plan for a bunch of movie days! Once a week, twice a week–every day for a month? Anything goes. And no, you don’t need to do an analysis of each movie when it’s over and call it “school.” Also, I give you permission to nap while your kids watch the movie, sit and read a good book, or sneak off to do yoga while they watch. It’s all good! Host a gameschooling day: Pull all the games out the night before and set out the snacks. Tell the kids you’re staying in pajamas all day (I won’t judge if this is already a given in your home) and just play games! Team games, solitaire games, card games, and board games. Put on some good music, light some candles and enjoy a day of play. Get outside—everyday: Look, I am not a cold weather fan at all. I keep moving south to get away from snow. That said, there’s something about getting outside in the fresh air and moving your body. You need it. Your kids need it. Check out local outdoor ice skating rinks, nature preserves, local parks, or just take a daily walk around your neighborhood. Have the kids plan some fun outside activities. Grab your coats and hats and mittens and bundle up. Be sure to have hot cocoa and tea for when you come back inside. Volunteer: Lots of local charities need assistance, donations, and funds all year round—not just at the holidays. Find a local organization where you can volunteer your time. If you’re in a homeschool group, make it a project that families can do together. 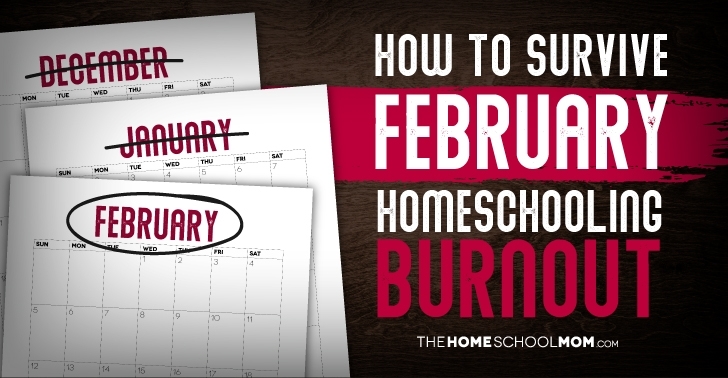 Now that you’re armed with some ideas, take the time to make a simple plan for February homeschooling. Share the ideas with your family and get them on board too. Let us know what you’re planning or what else you do to thrive and not just survive homeschooling in February. Great post! I love these ideas, as I struggle in February. I will implement some for sure. Thank you for reading, Sylvie! Have FUN in February! You are so right about February!! I think it gets longer with each year you homeschool. I have been at it for 14 years now and I agree that it helps to shake things up a bit during that dreaded month. I love your ideas! Now to plan some of these in the next week or so! Thank you for reading, Heidi! Let me know how your February goes and which ideas you try. Best of luck!